The Scottish SPCA is seeking the owner of a heavily pregnant cat found in an Edinburgh garden. Scotland’s animal welfare charity was called on Saturday (6 April) after residents of Duke Place took in the distressed long-haired feline. 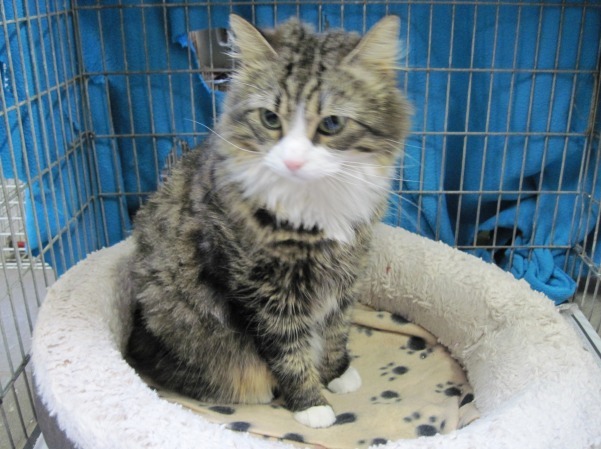 The young adult tabby and white cat is now in the care of the charity’s Lanarkshire Animal Rescue and Rehoming Centre in Hamilton, where she has been nicknamed Sasha. Inspector Sarah Gregory said, “The people who found Sasha had heard her cries for the past 48 hours and when they saw her swollen abdomen decided to give her some comfort and relief from the poor weather while they contacted us. “It’s possible Sasha has gone away from home to have her kittens and found herself in difficulty with the limited shelter nearby. “She’s an incredibly friendly girl and her long coat is well groomed so it appears she has been cared for until very recently. “We think Sasha may give birth any day now and it would be great if we’re able to reunite her with her owners.